When we chose spelt as the Test Kitchen ingredient, it was because I had given in to the ease of ordering from Amazon (as I always do) and bought several pounds of the stuff. I was on a health kick to find whole grains. My intent was only to purchase farro but the wretched "Customers Also Bought" scrolling bar made me curious about the spelt; a quick click and Amazon Prime produced a box of the stuff in two days' time. I gave a bag to my mother to try out too but she didn't read the instructions one day and ended up with hard-to-chew grains (she didn't soak it overnight). That experience delayed my exploration of this ancient grain but I finally decided it was time to try it out. In a soup, it expands and makes itself well known as an ingredient, lending a nutty flavor and texture to the dish. 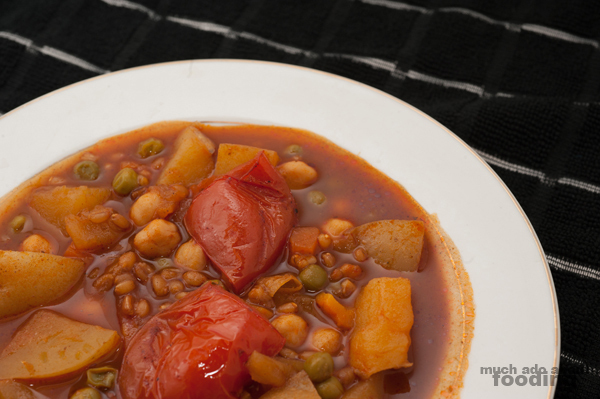 I quite liked this soup which turned out like a vegetarian beef stew. Try out the recipe yourself and enjoy. I like letting aromatics and spices open up with heat. In a large pot, barely cover bottom with olive oil on medium high heat. Add in garlic cloves, oregano, paprika, and cumin. Stir until oil absorbs a lot of the spices' flavors and colors. Add in potatoes and stir until coated. Then add spelt and coat in oils; stir for 2-3 minutes. Once the spelt has looked like it is getting a little toasty, add in beef broth, water, and tomato paste to the pot. Stir until paste dissolves. Bring to a boil. Reduce to a low simmer. Add in peas, carrots, and bay leaves. Cover and simmer 30-40 minutes until spelt is tender. 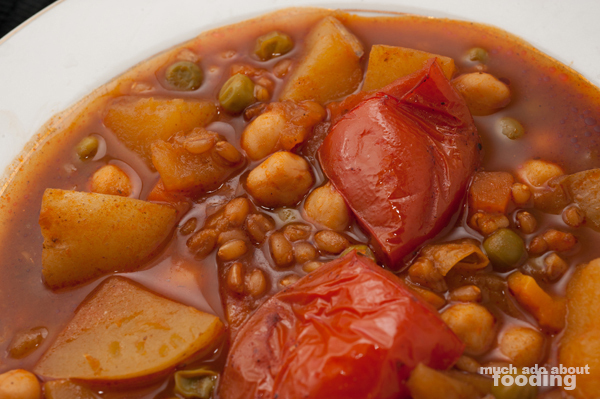 Add in chickpeas and quartered tomatoes. Simmer with the lid on another 20 minutes. Turn off heat and stir in garlic salt. Serve and enjoy! 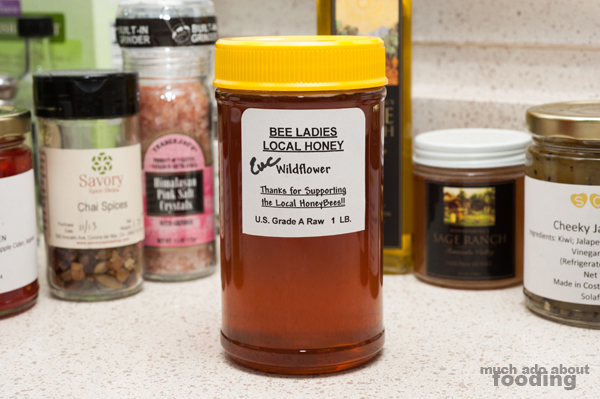 We ran into the Bee Ladies' booth at the Newport Beach Farmers' Market at Lido Village not too long ago and fell in love with the honeys we tried. We ended up buying three varieties but I wanted to play with the eucalyptus wildflower one which has both aspects of sweet and slightly savory. I can see it being usable in both baking and cooking so I am open to suggestions! What do you want to see me do with it? I love seeing reader recommendations! #MushroomMakeover - Week Four and Final Recap!